Much of the immune system and the process of inflammation takes place in the gut. Listen as I join Dr. Taz to explain SIBO, FODMAPs, and how to improve your health by aiding your gut. Dr. Taz Bhatia: Welcome back to the show where every episode we’re trying to help you write your own personal prescription for power. That’s right. This is Power Rx. And joining me today is Dr. Ruscio. Dr. Ruscio gives smart, busy people suffering from symptoms like bloating, fatigue, and unexplained weight gain simple steps to start living a healthy and enjoyable life again, no matter how long you’ve been suffering. So many of you suffer with gut issues. Dr. Ruscio has spoken at the SIBO Symposium summit, the Paleo f(x), the Ancestral Health Symposium, Sean Croxton’s Digestion Sessions, as well as many other international conferences and top health podcasts. Welcome to the show, Dr. Ruscio. Dr. Michael Ruscio: Hi, thank you for having me. DrTB: Well, we’re thrilled to have you. I’ve got to admit this is a question that comes up over and over again in practice. And when I speak to people, everybody’s really, first of all, concerned about gut health. And they’re super confused about SIBO which is small intestinal bacterial overgrowth, really confused about what that is. Do they have it? How do they treat it? Tell us a little bit about how you jumped into the world of gut health and how you became so specific in dealing with SIBO. DrMR: Well, I would love to. And I’m sure many listening have probably heard before in various interviews, I had my own personal health experience which diverted me down the path into more integrative medicine with a focus on gut health. Long story short, when I was in college, I went from feeling really good overall to having insomnia, brain fog, fatigue, mood dips. And this led me on a journey to discover what the answer was. It ended up actually being an intestinal infection that was causing all those symptoms. But I didn’t realize that right out of the gate. I was pursuing what I thought was hypothyroidism or low testosterone or heavy metal toxicity or adrenal fatigue. So I did what wouldn’t be unexpected to do. I went on the internet. I started searching my symptoms. And of course, you pull up various articles and videos and what have you. And that’s all fine and good, but I didn’t have the greater context of understanding how important it is to start your journey with a gut evaluation in case you have something in your gut that’s contributing to your symptoms. So I spent several months spinning my wheels. Eventually, I determined that I had an intestinal infection that was the underlying cause of all my symptoms, even though I didn’t really have much in the way of digestive symptoms specifically. And it was addressing that underlying cause in the gut that finally allowed me to have long-lasting improvement in my symptoms. And then, as I got into clinical practice, it turns out that my experience was fairly common. And there were many other people who were pursuing what they thought was the cause of their symptoms: thyroid, adrenal. And not to say that sometimes those aren’t the cause, but in many cases, there’s an underlying gut problem that’s really at the root cause of someone’s symptoms. And this can go all the way to something like brain fog or insomnia even. And by addressing that, they can see very profound improvement. So that’s become a progressive area of focus for me in practice because it just delivers so much in the way of symptomatic improvement. DrTB: It’s so funny how so many of us have entered the field after our own personal issues, really searching for answers on our own. So you started this right out of college. So you would’ve been pretty young when your symptoms began. Is that correct? DrMR: Yeah, I was about 23. And the doctor who treated me said—because I had an amoebic infection which is a fairly pathogenic infection. He said, “This is going to be an unpleasant process, but it’s also going to be one of your biggest gifts because it’s going to teach you firsthand what patients go through and what happens in your body when you have an imbalance in the gut.” And he was absolutely right. It was not pleasant in the moment, but I learned so much from it. And it gave me such a valuable grounding experience that has been like the set of the sail to help me stay focused on this very important area for people’s health. DrTB: I think it’s such an important area. Some of my background is in Chinese and ayurvedic medicine. They recognized the importance of the gut thousands of years ago. This was not a new or novel idea or concept for them, so much so that they believed if you didn’t have good gut health, you really didn’t have health. That’s really how they defined everything. I think it’s taken us in Western medicine a really long time to catch up to that idea and to that philosophy. Why in your opinion, just thinking about your practice and what you deal with day-in and day-out, why do you think gut health is so important? I have my own opinion just based on my experience. I’m curious to know what you think. DrMR: Well, we know that the small intestine is responsible for over 90% of caloric absorption. So there is one huge aspect. If you don’t absorb your food well and your nutrients well, it’s almost akin to eating an unhealthy diet because you’re absorbing an unhealthy amount of nutrients. So that’s one foundational factor. And there’s also the observation that the small intestine contains the largest density of immune cells in the entire body. And so, we have this very immune-rich organ which is our small intestine, and if things there are not in harmony, if the immune system is reacting, then that’s a source of chronic inflammation in the body. And that inflammation, as we know, can cause a litany of symptoms and correlates with a number of conditions. So those may be two of the more important aspects. The way you impact your nutrient absorption and the way you can affect the status of the immune system and inflammation which are very tightly linked. There are others, but I think those would probably be two of the most profound mechanisms through which the gut health leads to such an impact on one’s overall health more broadly. DrTB: And for those of you listening, I really hope you caught that. That is a central tenet as to why gut health is so important. So much of our immune system is centered there. So much of the whole process of inflammation begins there. And honestly, I’m sure Dr. Ruscio would agree, most of what we deal with today in terms of medical practice are diseases of the immune system or are diseases of inflammation. So this is a really, really important topic, and I hope everyone’s taking notes and just trying to get whatever you can get out of this particular episode. What are some of the reasons—what causes some of these problems in the gut. I don’t think anyone sets out thinking about gut health and certainly wanting to cause issues. I’m sure you’ve experienced this as well. This is kind of the why of why someone who eats perfectly healthy and really is meticulous about their diet is still unhealthy when this particular aspect of their health is not taken care of. What do you think causes a lot of these gut problems? DrMR: You make such a critical observation there which is if someone’s been eating healthy and they’re still not feeling much better, then it’s very important to not try to necessarily force a dietary solution to what may be a non-dietary problem. And that’s one mistake I see people make quite often, which is they go on progressively more restrictive diets. And yes, sometimes we may need a more restrictive diet in the short term, but it’s very important not to go on a diet that’s highly, highly restricted at the same time missing the fact that you have an active issue in the gut that’s the cause of all your symptoms. I just want to echo that because that’s such an important concept. But regarding underlying problems in the gut that can be the causative factor, food intolerances—and I’m using that term loosely—but eating foods that don’t agree with you probably the most foundational because that’s going to be the easiest to fix and the most cause-based. DrMR: And once you’re eating a healthy, whole food-based diet, then the two chief items to concern oneself with, in my opinion, would be foods that your body does not react well to because you’re a bit food intolerant, meaning you have this, for lack of a better term, inflammatory reaction. So some people will have some inflammation if they eat gluten or dairy or soy. So cutting out the common—again, I’m using the term loosely—allergens that may not agree with the gut and cause this inflammatory immune reaction. And then, the other underneath the food umbrella would be not consuming foods that don’t work well for your microbiota or the world of bacteria and fungus in your gut specifically. And these are known as foods that are rich in FODMAPs which are seemingly healthy foods on the surface. And this can throw people sometimes because a food such as broccoli or asparagus, for some people, especially for people with digestive symptoms, may actually be contributing to your symptoms. That’s not to say you never eat those again, but you may have to go through a short phase where you curtail the amount of FODMAP or prebiotic-rich foods that you’re consuming. And just briefly, why that’s relevant is because these foods that are rich in FODMAPs or prebiotics are very good at feeding bacteria. And that can be a good or a bad thing depending on what’s going on underneath the hood of your digestive tract. If you have a bacterial overgrowth known as small intestinal bacterial overgrowth, as you alluded to earlier, if you eat a diet rich in these FODMAPs, in these prebiotics, then you’re feeding an overgrowth. And of course, that can exacerbate the problem. So those are two places to start: an elimination diet and/or a low FODMAP diet. DrTB: Ok. I’m going to stop you because you’ve said two things that I know everyone starts—their eyes start to swim a bit when they hear these words. And I can see the flush and the panic the minute they hear them as well. So let’s unwind them just a bit. So the basics are the basics. We can’t make those any better, unfortunately. I wish we could. But processed foods, sugars, diets high in food additives, preservatives, all of those type of things are going to be bad for the gut. So some of this is our Western lifestyle, convenience foods, packaged foods, and what they’ve done. But once you accomplish or sort of hit that layer one of removing that stuff from your diet, the next conversation to have is getting into what is SIBO, or small intestinal bacterial overgrowth, and what is the FODMAP diet? And, Dr. Ruscio, I will tell you patients try really hard with this diet, but get super frustrated with it. In your opinion, how would you best describe the symptoms and signs of SIBO and how would somebody know that they have it? And then, from there, let’s help them with that FODMAP diet. What are the top five things you would tell them because they have SIBO, and it’s confirmed either through their history or testing or things like that, this is what they probably need to do next? Help us bridge that because I just see the struggle when I’m working with patients or even speaking on this topic where people get super, super confused about this. DrMR: Sure. And it’s very understandable, and I agree with you completely which is why I think it’s important people obtain information on this issue that’s well thought out and not overzealous. Because you’re absolutely right. Sometimes people are obtaining the information perhaps from a well-intentioned but an overzealous source, and that may cause them to have more fear around small intestinal bacterial overgrowth and it’s justifiable. So I just want to make sure to say that most of what I’ve seen my patients read on the internet regarding SIBO makes SIBO look far worse than it actually is. DrTB: Thank you for saying that. DrMR: If you’re obtaining competent advice that’s evidence-based, it’s not something to be overly concerned about. It’s very treatable, and so I just want to preface my comment by saying that. I think from a mental perspective this may provide some psychological ease. Small intestinal bacterial overgrowth, essentially as the name alludes, is a condition of excessive bacterial growth in the small intestine. And you can test this with a breath test, although I don’t think that is as necessary as it’s often portrayed to be. It can be helpful, but you don’t necessarily need to have the testing. Now, the symptoms, you have your classical box of symptoms which would be your IBS-like symptoms, abdominal pain, bloating, and altered bowel function, meaning you have constipation, diarrhea, or sometimes you oscillate between the two. And then there are some other similar digestive symptoms that we’re seeing small intestinal bacterial overgrowth correlated with: reflux, indigestion, heartburn probably the most common. Here’s where it gets a little bit more complicated, though. Because there are other non-digestive symptoms that can be associated to SIBO or, more broadly, to impaired digestive health. And this is where it can make it difficult to say if I have X, Y, Z symptoms, I may have SIBO or a similar gut imbalance. We know, for example, that you can have a gut problem or SIBO that can manifest as digestive symptoms. That’s kind of an easy one to piece together. But we’ve also seen SIBO highly correlated with small intestinal bacterial overgrowth. We’ve seen certain gut imbalances when treated improve thyroid autoimmunity. We see certain gut imbalances correlated with mood problems like anxiety, depression, and brain fog. We see some trials showing the treatment we go to improve metabolism via cholesterol markers and blood sugar markers. We see the treatment of SIBO able to improve rosacea and certain dietary changes able to improve skin conditions. And we see gut treatments at large able to improve rheumatoid arthritis and inflammatory bowel disease. So since the symptoms can be so broad, I think it’s helpful to provide people with a hierarchy, meaning start with the basics like we mentioned a few moments ago. And then if the basics don’t get you to a point where you feel fully improved, the next thing to do would be to go through a gut evaluation. And that may include SIBO. Although, I don’t necessarily think you have to do a SIBO test, but whether you use something like a self-help plan provided in a book or you work with a provider, the next thing I would do is do a gut health check-up. And then, regarding the low FODMAP diet, the nice thing about the low FODMAP diet and many diets, if you use them pragmatically, is you only require two to three weeks on the diet to be able to ascertain whether or not that diet will help you. DrTB: That’s encouraging. That’s good news. DrMR: So if you find a low FODMAP food list on the internet, you only need about two weeks, maybe three weeks tops. And if you’re not clearly noticing you’re improved at the end of that two to three weeks, then that may not be the diet for you. And there’s more that we can outline there, but I’ll pause there in case you want to add anything to that. DrTB: No, I just think that should be encouraging for everybody listening. I think people think that this is going to be a change forever. They’re never going to be able to eat anything they ever want to again. DrTB: If you’re out there suffering from some of these symptoms Dr. Ruscio was talking about, just thinking like for two to three weeks this is something that you’re going to focus on, I think that’s manageable. And tell us a little bit more about what that involves. DrMR: Right. And you’re absolutely right. It is manageable and it’s important to know that this doesn’t mean forever because oftentimes that’s where people go. If you say, you need X, Y, or Z, people will immediately go to, “Ugh, I can never have broccoli or asparagus again or onions or garlic.” No. Most diets follow a similar trajectory of, first, be a little bit strict, yes. Eliminate the foods not on the diet. But on the tail end of that, then you reintroduce the foods that you cut out to find out where your personal boundary for the diet is. And that’s a key aspect. So that would be how you implement the FODMAP diet amongst many others. You start with a more strict application of the diet, and then you don’t necessarily have to perform the reintroduction after two to three weeks. You just need to get to the two to three-week mark and then reassess and say, yes, I’m clearly feeling better or, eh, I don’t really feel any different. And if you’re saying, eh, then you move onto other diets or other therapeutic options. DrMR: But if you’re saying to yourself, yes, I clearly feel improved, then I would ride that diet until you see a plateau in your improvement. Then wait a couple weeks to make sure that you’re stable in your new peak of health, and then you can perform a reintroduction from there. DrTB: Got it. That’s not bad, guys. We can all do that. That’s not terrible. 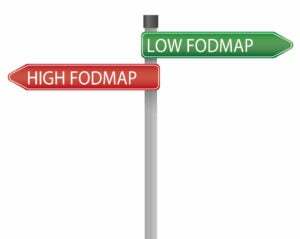 And those FODMAP foods that you’re referring to, you’ve mentioned them a couple of times. You mentioned broccoli, garlic, onions. What else would be in the family of FODMAP foods that somebody would be consciously trying to remove? DrMR: What’s funny is you are looking at a lot of seemingly healthy foods that you cut out on the low FODMAP diet which is why this is so counterintuitive. So there’s many vegetables that we would label as healthy: artichoke, asparagus, broccoli, Brussel sprouts, eggplant, onion, apples, mango, pear. It’s a list that it would do one well to look at because, again, many of these we would stereotype as healthy foods. And it’s not to say that they’re unhealthy foods, but they’re very rich in those prebiotics. This also includes a number of dairy products because dairy has the lactose that, for some people, can function very highly as a prebiotic. And a number of grains like wheat and rye. In fact, some of the research is suggesting that the reason why some people are benefiting from a gluten-free diet is because a gluten-free diet also restricts these FODMAPs. And it may be because, while they cut out all the processed foods, now they’re eating a very FODMAP-rich diet. It can be very frustrating. DrTB: Interesting. So what can you eat on the FODMAP diet? What are things that people usually when they cut all these, like you said, healthy foods that many of us love, what can you eat on this particular diet? DrMR: And that’s the good news. There’s a lot of foods that you can eat. It’s just needing that map, that diet list to guide you. So you can use bok choy, carrots, beans—green beans, that is—squash, potato, taro, zucchini, gluten-free bread products can work, blueberries, boysenberries, cranberries, kiwis, lemons, oranges, lactose-free milk, oats, hard cheeses. DrMR: So there’s a lot you can do. DrMR: But it’s just having that little bit of a guide to help you go through your shopping cart and say, “Ok, these are the foods I’m going to focus on, and these are the foods that I’m going to avoid.” And I should also mention, it’s not to say you can’t have one bite of the high FODMAP foods during that two to three-week diet experiment. You just want to reduce them as much as you can. If you go out for a work event one night and you have some broccoli, it’s not going to be the end of the world. You just want to attempt for an 80-90% compliance during your dietary experiment. DrTB: And Dr. Ruscio, you have a book that was just released in February called Healthy Gut, Healthy You. Are a lot of these lists and resources in that particular book? DrMR: Yes. This book comes with a number of handouts, not actually in the book but as part of the online compendium to the book. So you’ll have a handout for an elimination diet that cuts out those inflammatory foods like we mentioned a moment ago. You have a handout for a low FODMAP diet also with some resources for cookbooks and essentially a number of handouts to help you along your journey. In the book, I try to give people a map in terms of, ok, here’s all the stuff you’ve heard regarding your gut: paleo diet, low carb, low fat, low FODMAP, probiotics, enzymes, antimicrobial herbs. What do we do when? How do we sequence this? And how can we apply this information in such a way that we will be practical? We won’t go on crazy diets for too long and we’ll use dietary supplements but not overly use them and try to make this as efficient and as empowering of a process as we can. DrTB: Well, actually, that was going to be my next question because I am curious as to your opinion on—I know you talk about this in the book, but I’m curious as to your opinion on the role of probiotics, on the role of digestive enzymes, other supplements that we see that are gut-based, bitters. There’s a whole litany in the gut nutraceutical toolbox. What do you think works for somebody who’s—they understand the importance of diet. I always say if you don’t master the diet component, then it’s really hard for any supplement to do much for you. But they’ve mastered the diet part. They’ve bought into the idea of SIBO. What are some of the supplements that you’ve seen work in the most efficient way when somebody is struggling with some of these different symptoms? DrMR: Sure. That’s a great question. The first thing, again, definitely diet. And that’s why, step one, in the healing protocol in the book is a series of short, mini experiments to help you find the best diet for you and for your gut. Because it’s not going to be the same for everyone. So we want to do a little bit of tinkering to see if we can fix this with diet because, again, you’re absolutely right. That’s where we want to start. It’s very important because we don’t want to be going on fancy supplements when the diet may be the cause of the problem. So definitely start there. But then, step two, we introduce and we outline enzyme therapy and also hydrochloric acid. Some people may have heard of hydrochloric acid or betaine hydrochloride which is a supplemental way to take the acid that your stomach produces as part of the digestive process. So we talk about enzymes and acid and then also probiotics. And that’s really our step two. And probiotics can be very effective. Out of all those I just mentioned, we have by far and away the best evidence supporting the beneficial role of probiotics. And probiotics have been shown to help with everything from bloating and constipation through anxiety and depression. And that’s the far-reaching impact of the gut. It can even reach all the way to your brain and influence things like anxiety and depression. Probiotics can be very confusing for people because there are hundreds of products out there. And it seems like every few weeks there’s a new product out. And of course, every time a product is released, the company wants to market that product, so you get all these bits and bites. And it’s very hard to know why is this probiotic better or is it not any better, is it the same as the other one I heard about previously. And in the book, I introduce a category system that’s based on the research that helps people really simplify this. And we can supply probiotics down to three main categories. Category one is a mixture of Lactobacillus and Bifidobacterium strains and there are many probiotics that fit this bill. DrMR: This is what most people will see in health food stores or may have tried previously and that can be a very helpful type of probiotic or category one Lactobacillus and Bifidobacterium strain mixture. So when you look on the label, you’ll see mostly Lactobacillus X or Bifidobacterium Y or what have you. Category two is a healthy fungus known as Saccharomyces boulardii. And on the label, there you’ll see, predominantly, Saccharomyces boulardii. And then, category three are soil-based or spore-forming probiotics. And you typically see different strains of Bacillus in this type of formula. And figure out which one or maybe all three of those works well for me because what happens sometimes is, let’s say, someone goes on a category two probiotic, the Saccharomyces boulardii, and they notice nothing. But then a few months later, they go on another probiotic that has a different name, but they didn’t read the label to realize this is essentially the same thing I was using before. It just has a different name on the label. So when you understand that, you can greatly simplify the probiotic process and figure out what of this very helpful therapeutic line you should use and then move on. DrTB: Wow. What great information. I have so many more questions. I’m sure all of you out there listening are as well. But hopefully, this episode has cleared up a little bit about SIBO, FODMAP, probiotics. I’m sure there’s much more. Dr. Ruscio’s book is Healthy Gut, Healthy You which you can find on Amazon and anywhere that books are available. Dr. Ruscio, any parting thoughts before we say goodbye to you? This has been, I know, tremendously helpful to everybody out there listening. DrMR: Well, thank you. And what I would leave people with is remember that improving your gut health should be a journey that makes you feel empowered, and it should not make you feel fearful or afraid of food or depend upon supplements. So if you’re getting that feeling with whatever you’re reading or listening to, I would urge you to take some steps to try to find some information that seems a bit more empowering and a bit less fear-mongering. Because unfortunately, there is a fair amount out there on the internet. And I see more patients than I’d like to admit come in who are very distraught around this issue. And that’s why I wrote Healthy Gut, Healthy You is to give people a guide that would not make them fearful, would help them feel empowered, because that feeling of fear is not healthy for you. So it’s important that you’re not afraid, and there’s really no need for you to be afraid. So that’s what I would leave people with. DrTB: I love that. I couldn’t agree more. And for everybody out there listening, grab a copy of Dr. Ruscio’s book. It’s Healthy Gut, Healthy You. It’s on Amazon. And remember, we want you empowered, and every day is an opportunity for you to find your power and write your own personal prescription for power. Thanks for joining us. Thank you, Dr. Ruscio. I am in crisis with my gut health and don’t know what to do any more. Low Fodmap diet has done nothing. I don’t eat any grains, dairy, gluten, nightshade foods onion, garlic, fruit, sugar or processed food. I have a permanent metallic taste in my mouth which comes on during/after eating. And a burning throat. I am depressed and anxious because of my symptoms. I don’t have SIBO and probiotics/fermented foods make my health worse. I am prone to constipation. I am starving hungry all the time. I am a healthy weight. What do I do? I don’t know what to eat anymore. I crave fat but that seems to make things worse – even extra virgin olive oil. I don’t know what to eat anymore. I have your book but find it overwhelming. I live in the UK. Sorry to hear this Natalie. I would go through the protocol in Healthy Gut, Healthy You. This provides the best available roadmap for gut healing I know of. Also, make sure to follow up with your doctor if you have not already. Hang in there, help is on the way with that protocol. I feel as though I am a little bit stuck. I have been on PPIs for 10+ years with no confirmed cause of my GERD. A few months ago I was treated with anitbiotics for H.Pylori and I haven’t been the same since – I am having trouble figuring where to go next. I want to get off of my PPI but know I need to figure out my underlying problem. So my first question is which is the best diet to start with? I know you recommend paleo, but I have also heard of “psedu-keto” (keto but still eating fruit, to minimize sugar intake for possible gut (SIBO? bactera)). Or should I go directly to LOWFODMAP? My following question is how do I know if the food diet is helping if I am in a lingering state of inflammation from the H.Pylori inflection? How can I heal my gut from this? and how will I know if the PPI is not tampering with the results? There isn’t a simple answer here. I would start by going through the comprehensive self-help plan in my book, Healthy Gut Healthy You. This will answer some of your questions. If the book isn’t able to fully help you could make an apt. at my office, but most likely the book will get you there. As much as I LOVE all your podcasts, I didn’t feel like this one really spoke to SIBO itself. Low FODMAP diet isn’t going to fix SIBO so we all still struggle with that issue. I had mild SIBO but a lot of symptoms, did 2 rounds of herbals, and now 4 months later my SIBO results (and symptoms) were classified as Severe! I am thin, an athlete, and eat mainly organic veg, not much carbs/sugar. I’m not perfect and have occasionally binged on dessert or wine but still 80% + healthy. SO how does this come back? Do I have to go back to starving myself (basically) when that didnt even work in the first place. I even intermittent fast until the afternoon and I’m still painfully gassy (SIBO primarily hydrogen). I’m so scared, frustrated, and depressed. I just want my normal life back (along with my 6 pack 🙁 ). Waiting on a stool test, but wondering what else I should be doing next. Another round of herbals, antibiotics, ? Is there ever a cure? (ps my zonulin was surprisingly at Low). I came to your office for digestion issues back in 2015 and I was diagnosed with SIBO. A little bit after the test I got pregnant and had to stop the treatment for SIBO unfortunately. Its been almost 3 years of intense motherhood and breastfeeding but now its my time to regain my health back. I called your office and realized that the first available appointment is in July 2019. I can’t wait that long and so Im looking for a different solution. Can you perhaps recommend another practitioner in the Bay that can help me cure SIBO? Much appreciate it!